Late breaking news! Jerome (Where’s the Real Birth Certificate?) 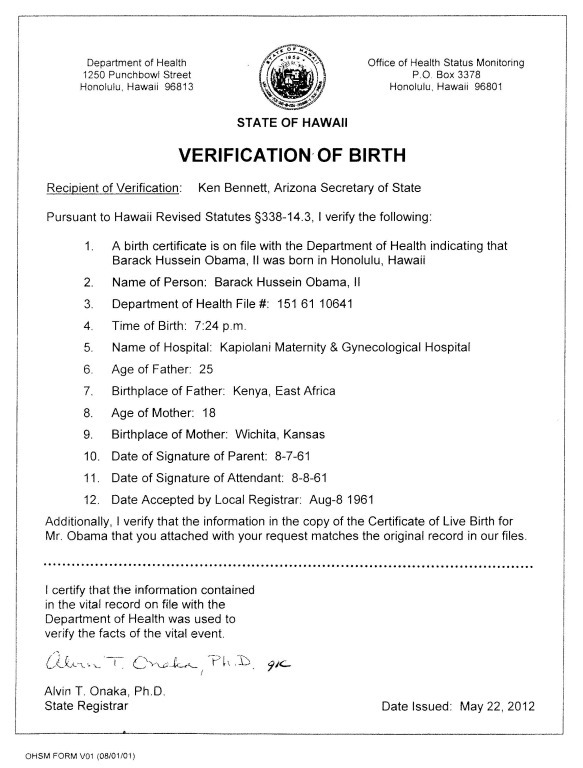 Corsi has agreed to debate John (Is Barack Obama’s Birth Certificate a Fraud?) live! Also appearing will be Mara Zebest, Karl Denninger, and Tom Harrison. This promises to be the definitive slug out between those who think Obama’s long form birth certificate is a fake, and those who think the proof just isn’t there. I hope both sides will offer their best case. This will be on Mark Gillar’s Tea Party Power Hour Blog Talk Radio program tomorrow, Saturday, January 21, 2012 at 3 PM Eastern Standard Time (9 AM at Barack Obama’s birthplace). Follow the story on author John Woodman’s web site. It appears he is going to debate birthers on their terms, too bad. Show with Woodman starts at 2:00, Corsi will show up at 3:30, probably after Woodman is gone. brilliant comment “Prepare for the Kenyan Marxist homosexual perp walk.”, come back on Jan 27th with it! richCares: Show with Woodman starts at 2:00, Corsi will show up at 3:30, probably after Woodman is gone. richCares: It appears he is going to debate birthers on their terms, too bad. What other terms are there? It’s an invented controversy. Stating the facts takes about 3 minutes and is dull as dirt. You can always invent irrational questions and demand unneeded answers. Seriously, this whole debacle is birthers saying whatthehellever question mark, and anti-birthers (generally known as ‘realists’), negating. Anti-birthers would not exist without birthers. But birthers would exist without anti-birthers. So….what other terms are there other than birther terms? If not their insanities, what else is there to talk about? They can play with their poo, we can play with their poo, but it’s ultimately their poo. We can remind them, but not force them, to flush. They can flush whenever they want to, whether reminded or not. the problem is that Mr. Woodman thinks facts, logic and truth can win the day, but these are birthers he is debating, they don’t kniow what is logic, truth or the facts. They are driven by hate and delusions. Dr C had once wrote that debating birthers is a waste of time, he was right, Mr Woodman will soon verify that. You’re quite right, richCares. A talented but devious public speaker can discredit a truth-telling opponent. Remember the Sophists? richCares: the problem is that Mr. Woodman thinks facts, logic and truth can win the day, but these are birthers he is debating, they don’t kniow what is logic, truth or the facts. They are driven by hate and delusions. Dr C had once wrote that debating birthers is a waste of time, he was right, Mr Woodman will soon verify that. I fail to see the point of such a “debate”, since none of the participants have access to the actual document. It seems equivalent to a bunch of art experts “debating” whether da Vinci painted the Mona Lisa, looking only at a picture my cousin Joe took with his cell phone when he visited the Louvre. And really what does it matter? No one actually cares about this silly, made up issue. On a list of 100 issues the voters care about it ranks #4568. And “Tea Party Radio”? Please. If Corsi admitted abject defeat, not one of them would vote for Obama anyway. As for the politics, Gingrich proposes firing federal judges he disagrees with. Republican audiences cheer. How is this different? Can we get Judge Judy to MC this ‘debate’? As I pointed out in the other thread, this is a primary in a nomination race that Obama is the only contestant in. So he will be the nominee. And the Democratic nominee is automatically on the general election ballot. Very likely to be true but we are discussing this case. Could Obama afford a judge ruling him in contempt and ineligible to be on the primary. Imagine the impact… When the party files the nomination papers, it may very well be another opportunity to object although there is at least one court ruling that has rejected this. Scientist: I fail to see the point of such a “debate”, since none of the participants have access to the actual document. It seems equivalent to a bunch of art experts “debating” whether da Vinci painted the Mona Lisa, looking only at a picture my cousin Joe took with his cell phone when he visited the Louvre. NBC, I think you have taken a statement I made on a different threat and I believe are applying what I said completely out of context here. I cannot be sure, because you have placed a citation without clear attribution to its source… but again, that is your doing, not mine. I believe this source quote, which looks like you took from me, was actually referring to Obama being the only name on the Democratic Ballot in SC and therefore he would not be hurt at all if most of his voters voted for Stephen Colbert as “Herman Cain” instead of him. The point being that he wins that race by default, because he is unopposed. In terms of your argument, I agree with your conclusions, but I never set up the false premise in relation to that case, which you appear to be using in order to create a strawman argument to make a point. I do not appreciate being used as a strawman nor being taken out of context. NBC: Very likely to be true but we are discussing this case. Could Obama afford a judge ruling him in contempt and ineligible to be on the primary. Imagine the impact… When the party files the nomination papers, it may very well be another opportunity to object although there is at least one court ruling that has rejected this. NBC: As I pointed out in the other thread, this is a primary in a nomination race that Obama is the only contestant in. So he will be the nominee. And the Democratic nominee is automatically on the general election ballot. Correction: NBC, I just found the original quote you put here came from Scientist, not me. So my apologies in advance, for thinking you had taken a different (but very, very similar statement) I had made on a different thread about a different issue. It also appears your response to Scientist is not a strawman argument either. …Just not something that came from another conversation on that other thread. I was mistaken. But such mistakes can easily happen when you grab unattributed quotes from other threads and inexplicably paste your reply to them here instead of on the source thread where that conversation was happening and is still going on…. the full context becomes lost in the shuffle and just creates confusion. G: NBC, I think you have taken a statement I made on a different threat and I believe are applying what I said completely out of context here. I cannot be sure, because you have placed a citation without clear attribution to its source… but again, that is your doing, not mine. I have been listening to Mr. Woodman’s debate. He is finding out what birther really means, he out numbered, out shouted, and making no gains with those idiots. A total wastec of time. Mr. Woodman will appear on Reality Check radio, I ma sure he learned his lesson. Corsi hung up an after hour, without even a goodbye. I believe I pretty much predicted as much when the idea was first floated. Too bad. I skipped through it. The scenario reminds me of the “Hermit Ren” episode of Ren & Stimpy, when Ren encounters his own split personality. Lots of pointless irrational questions, and Woodman trying to engage them down in the technical weeds. My favorite was Corsi demanding an explanation of why the WH chose to release a PDF doc as opposed to some other format, because, as he kept repeating, the papers from HI don’t mention a PDF document…so where did the PDF come from? Woodman should have been laughing at him at that point. Oh well. The best part is the last 2 min, when Gillar asked if everyone would be satisfied if Obama actually appeared in GA and presented a cert. copy of his LFBC personally. All of the birthers exploded, all trying to out-birth each other. Of course, they won’t be satisfied! Mr Woodman was a class act, too bad the birthers could not step up to his level. Birtherism is a manifestation of a person’s core mentality, and personality. A way for these people to rationalize, channel, and express negative, unpopular opinions and feelings. It’s a core of anger, fear, hatred, envy, resentment, take your pick. Not a good foundation for “class”. Some birthers are able to maintain a veneer of civility, but when challenged, they reveal themselves as volcanoes on a hair trigger. The ugliness that has taken refuge in birtherism always comes out. It seems they aren’t able to find a ‘good’, PC answer to the question, “Why don’t you like Obama?”, or at least not one they are willing to cop too … and possibly they are desperate for something, anything, that they can use to spread and further justify their dislike. VERY MUCH AGREED!!! Well said! JPotter: Birtherism is a manifestation of a person’s core mentality, and personality. A way for these people to rationalize, channel, and express negative, unpopular opinions and feelings. It’s a core of anger, fear, hatred, envy, resentment, take your pick. Not a good foundation for “class”. Some birthers are able to maintain a veneer of civility, but when challenged, they reveal themselves as volcanoes on a hair trigger. The ugliness that has taken refuge in birtherism always comes out. It seems they aren’t able to find a ‘good’, PC answer to the question, “Why don’t you like Obama?”, or at least not one they are willing to cop too … and possibly they are desperate for something, anything, that they can use to spread and further justify their dislike. Wow. They are obnoxious. Mara especially. This wasn’t a debate, this was “just mock, mock, mock.” Not allowing him to respond. A link to the audio has been added to the main article. There was one point I would nitpick with Woodman …. well, OK, two points. First, right off the bat, Gillar suggested that everyone, including Woodman, were amazed that the media has not given this “story” the coverage it deserves. 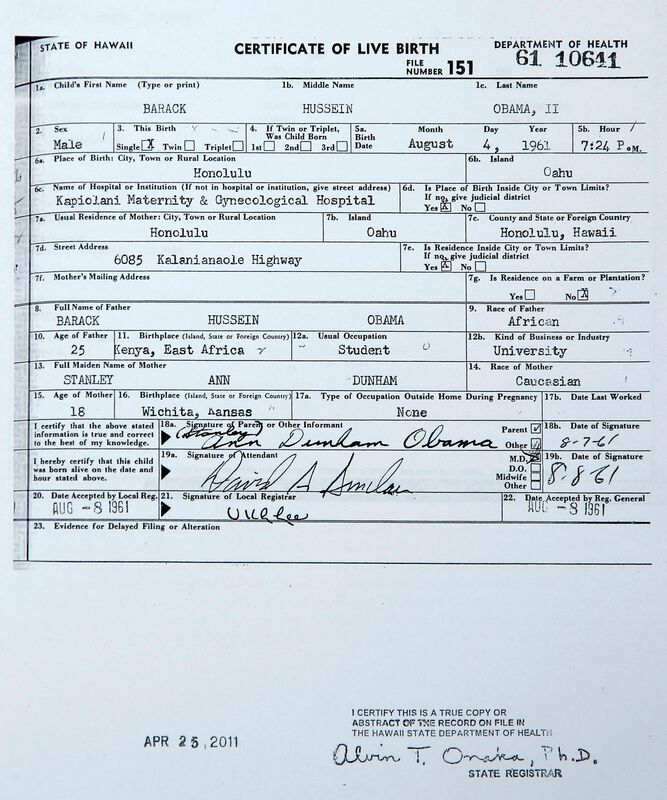 Of course all the birthers agreed …. but so did Woodman. If there was a story, the media would cover it. More airtime than necessary was wasted on it last April. The only thing the media would have now is to cluck their tongues and shake their heads, a waste of time. Time that they use wastefully enough as it is! Someday, this will make a nice, sarcastic documentary. The other point is focusing on the pointless technical weeds of PDF Madness. That truly is a waste of time. Should have stayed big picture and discussed all of the available images as a group, established that there is an actual document behind them all (or many identical forgeries have been made), allowing a cut-to-the-chase that was represented in the final minutes: the birthers will never be satisfied. Focus on their attempting to explain their irrational lunacy rather than his trying to make excuses for the nature of PDF files. JPotter, what I meant was not Obama’s eligibility in general. It was the forgery theories. And perhaps the NBC angle as well, though I’m less certain about the coverage on that. And I agree with you that focus on the PDF is a waste of time — however, many listening to the debate don’t believe that it is. I did however attempt to focus on the big picture that shows focus on the PDF is a waste of time. It was rather difficult to do so, as I was fairly shouted down while trying to explain why the PDF anomalies are irrelevant. But I did certainly attempt to do so. 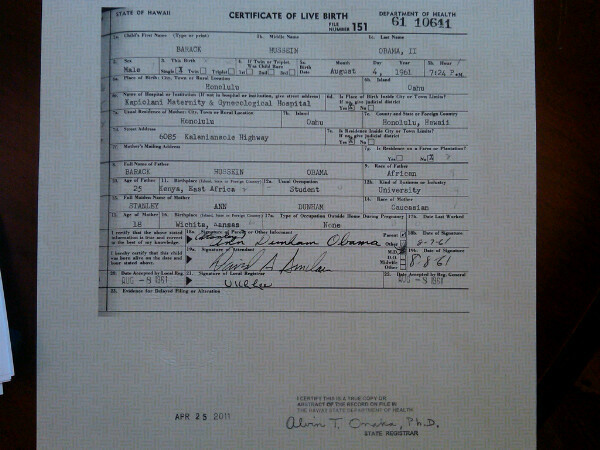 As for birthers never being satisfied: Oh yes, I agree. It’s simply not possible. John Woodman: JPotter, what I meant was not Obama’s eligibility in general. It was the forgery theories. And perhaps the NBC angle as well, though I’m less certain about the coverage on that. Were you surprised by their behavior? If the setup of the ‘debate’ was to debate mainly the PDF, or the other participants just wouldn’t get off it (from the parts I listened to, it sounds like they wouldn’t), then it was doomed to be an endurance contest. Birther thought leaders are not stupid people. Deranged, perhaps, but not stupid, and this is not their first rodeo. They’ve been employing this method of mudspinning before, in Corsi’s case, many times before. They know that by focusing on the irrelevant, they can make themselves appear to win. Gillar had been casting about for months to try to set this up. You degfinitely get credit for putting up with them. Any post debate feedback? I haven’t seen much mention online. Majority Will: Were you surprised by their behavior? No, I wasn’t particularly surprised by their behavior. When a person’s world view — or their reputation — is threatened by reality, they will typically fight to try and maintain it. In a debate, they are likely to turn to ridicule of the opponent (Mara Zebest), shouting down the opponent (Denninger), or focus on irrelevant issues in an attempt to distract the audience away from the threat (Corsi). Personally, I think it’s a bit of a hoot that Corsi attempted to elevate the question of “why hasn’t the White House issued a statement explaining why they released the document in PDF format?” into a supposedly important issue. I must admit that earth-shattering question took me a little bit by surprise. On the world view side, I have recently exchanged a series of emails with a man who runs one of the birther blogs. I honestly think he’s kind of going through a mild version of the Kubler-Ross psychological process that tends to come with any personal loss. Here he’s invested his time, life and emotions into this birther thing, and I’ve come along and rained on the parade. You can see some initial denial, and anger — directed toward me. I think reality may be starting to set in at this point, although of course he could also try to just shut off the reality so that he can maintain his world view. I actually feel a bit sorry for some of the birthers who are figuring out that there’s no good evidence for forgery, and that they’ve, in essence, made a foolish investment which for some of them is substantial. Heck, given the amount of time I’ve ended up spending on this — with darn little in return — perhaps I ought feel a bit a sorry for myself. I don’t, though. My investigation was in some ways an entrepreneurial adventure. I’ve honestly never been a fan of Mr. Obama, and if I’d found any good, hard evidence of forgery, I would’ve gone with that. And with hard evidence, I might well have ended up famous as a result. Fame, of course, makes one feel good — particularly if it’s “earned” through some extraordinary coup — and it’s often also translatable into economic benefit. Entrepreneurial adventures, though, often don’t work out. High risk of a venture not really going anywhere goes hand in hand with high potential. So I now am at the point of what further to do now, if anything. It’s a question of wrapping one thing up well, versus, in essence, cutting losses. In any event, the psychology of it all is different for me than it is for the poor birthers. J. Potter: Gillar had been casting about for months to try to set this up. I’m not sure about Gillar seeking a debate. I know that the debate, from my perspective, was at my request. I was the one who challenged the entire lot of them to a debate. There’s been some over at BirtherReport.com (thanks to them for actually covering the story). And a little bit of feedback at my own blog. I also did an hour-long “wrapup show” with Reality Check on Reality Check Radio. That was much calmer, and I had more opportunity to explain exactly why the PDF anomalies are entirely irrelevant. John Woodman: No, I wasn’t particularly surprised by their behavior. Heck, given the amount of time I’ve ended up spending on this — with darn little in return — perhaps I ought feel a bit a sorry for myself. I don’t, though. My investigation was in some ways an entrepreneurial adventure. I’ve honestly never been a fan of Mr. Obama, and if I’d found any good, hard evidence of forgery, I would’ve gone with that. And with hard evidence, I might well haveended up famous as a result. Fame, of course, makes one feel good — particularly if it’s “earned” through some extraordinary coup — and it’s often also translatable into economic benefit. Thank you. I appreciate your candor. John Woodman: I’m not sure about Gillar seeking a debate. Oh, he was! I am surprised to hear you initiated the encounter, that does change my perception of it. Sorry for making the assumption, but, yes, Gillar had been throwing down the gauntlet last year. He can be very pleasant, but always reveals a nasty side when challenged. And I can also appreciate that you wanted to discuss the technical points of teh PDF. Back in May, even June, there were a lot of people online who had stumbled across the issue, heard various viewpoints, and didn’t know what to think. Lots of opportunity for education about digital imagery, file formats, etc., what you can/can’t conclude from the WH PDF, what you are/aren’t seeing there. But those days are over. Now the only interest is from people who already decided it must be a forgery, and just want to hear talking points they can use to try to sound intelligent while they birth. There is one other service the debate provided: it gave people an opportunity to hear these nuts at their (*ahem*) finest, and decide whether or not these are people they want to be on board with. Not that the diehards would be disappointed, they want to hear them roar. But it will stand as yet another testament to the character of the birthers. There were some who felt that any such debate could only be a losing situation. I always felt differently. I know what the truth is, and I just simply believe that in such an encounter, as long as I do my part, the truth is likely to come forward — one way or another. And yes, one way that that truth may become evident is through the behavior of the parties involved. Even quite a few of the folks over at BirtherReport.com seem to have noted that the “birther experts” at a number of points simply tried to shout me down. And they may have noted a couple of points at which they attempted to ridicule me as well. I also pointed out their studious attempts to ignore every point I’ve made: how WorldNetDaily was given my analysis in August, and has refused ever since then to cover it, and how this is the first time any of the parties involved has so much as publicly mentioned my name. If you’ve got the facts on your side, then why would you try to ignore, shout down and ridicule your opponent? Why not simply bring forth the facts? Such behavior is more than just unprofessional. It’s a “tell” that there are quite likely very serious problems with your side of the issue. And I think there are people who will pick up on that. I am taking a Computer Forensics class for my BS in Information Technology. According to my reading, a PDF is a “Computer Stored” record (Created by the user of the computer). It is hearsay and is generally a waste of time if the judge can get a physical copy. Nelson, B., Phillips, A., & Steuart, C. (2009). Guide to Computer Forensics and Investigations. Boston: Cengage Learning. Nothing for you to feel bad about. You set about an endeavor and kept a clear head about it. You didn’t let personal bias blind you to focusing on clean results. That is very similar to how proper science experimentation is conducted all the time. Often, the results are not what you hoped for, but that answer itself is still very valuable, because your effort still tests and rules something out. John Woodman: Heck, given the amount of time I’ve ended up spending on this — with darn little in return — perhaps I ought feel a bit a sorry for myself. I don’t, though. My investigation was in some ways an entrepreneurial adventure. I’ve honestly never been a fan of Mr. Obama, and if I’d found any good, hard evidence of forgery, I would’ve gone with that. And with hard evidence, I might well have ended up famous as a result. Fame, of course, makes one feel good — particularly if it’s “earned” through some extraordinary coup — and it’s often also translatable into economic benefit. Bravo & Well Said! I support the position and reasoning you so well articulated here. John Woodman: There were some who felt that any such debate could only be a losing situation. I always felt differently. I know what the truth is, and I just simply believe that in such an encounter, as long as I do my part, the truth is likely to come forward — one way or another. If you’ve got the facts on your side, then why would you try to ignore, shout down and ridicule your opponent? Why not simply bring forth the facts?Such behavior is more than just unprofessional. It’s a “tell” that there are quite likely very serious problems with your side of the issue. And I think there are people who will pick up on that. In any event, thanks for tuning in to the debate, and thanks for your comments. * A comparison of all images shows that the PDF cannot be the original document, and there appears to be no rational way that the information in it was changed after it arrived into the PDF. I’ve gone into this in the book, to some degree in the debate, and possibly in more detail in a comment at my blog. I’m probably going to expand that into a full post. * The anomalies themselves are consistent with the statement above. 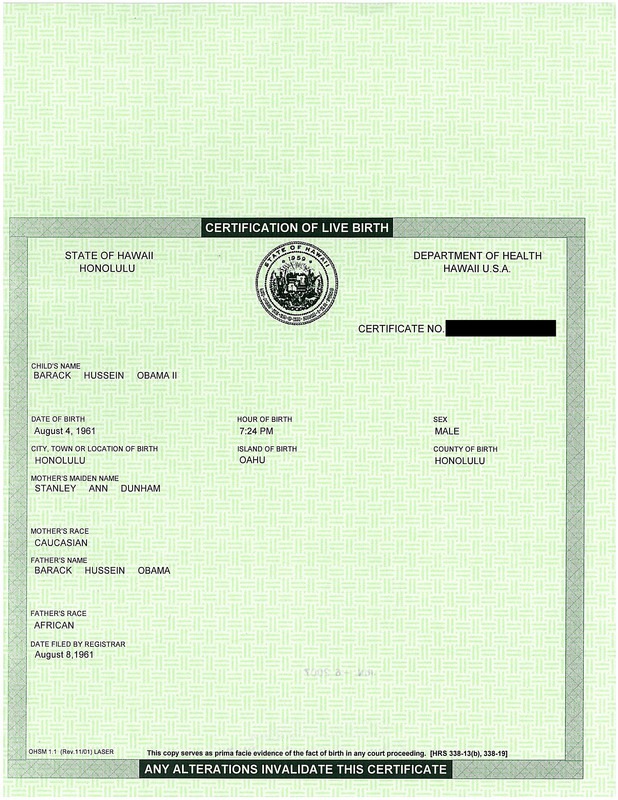 Virtually every “anomaly” we know of in the PDF can be fully explained by the simple proposition that someone scanned a paper birth certificate, sharpened it, and optimized it as a PDF for sharing on the web. * Let’s make a list of anomalies in the PDF that there’s still even a little bit of mystery about. To my knowledge, these include: A bit of blurring or shadowing in the form area. A few white pixels at the top that show no evidence of serving any purpose for a forger. Mind you, I’ve suggested some possible ideas of why these may be there. No real proof that mine are the correct theories, but there are some possible explanations for them. Those couple of small oddities — which fly in the face of ALL of the other evidence — are all that the birther experts really seem to have. In the meantime, they have advanced numerous claims of proof of fraud that have been CLEARLY shot down. They have a track record of ZERO for ever-how-many-claims-it-is-that-we’re-up-to-now. They pretend that this track record of absolute failure does not exist. They claim that if there’s the smallest little technical point — in a PDF file whose anomalies have already been shown to be irrelevant — that is either unexplained or not fully … GOOD HEAVENS! WE GOT PROOF OF FORGERY! CALL THE COPS! It just isn’t so. The entire preponderance of all the evidence is against them. It’s like a basketball team that tries to claim, after losing 82-6, that they’ve “won” the game because they were able to score 6 points. I simply don’t see any way that it isn’t “game over” for the forgery-in-the-PDF theories. 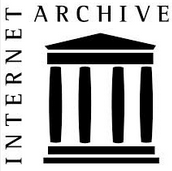 They claim that if there’s the smallest little technical point — in a PDF file whose anomalies have already been shown to be irrelevant — that is either unexplained or not fully understood … GOOD HEAVENS! WE GOT PROOF OF FORGERY! CALL THE COPS!